Add a big stick, and you have Chamula policeman’s uniform. 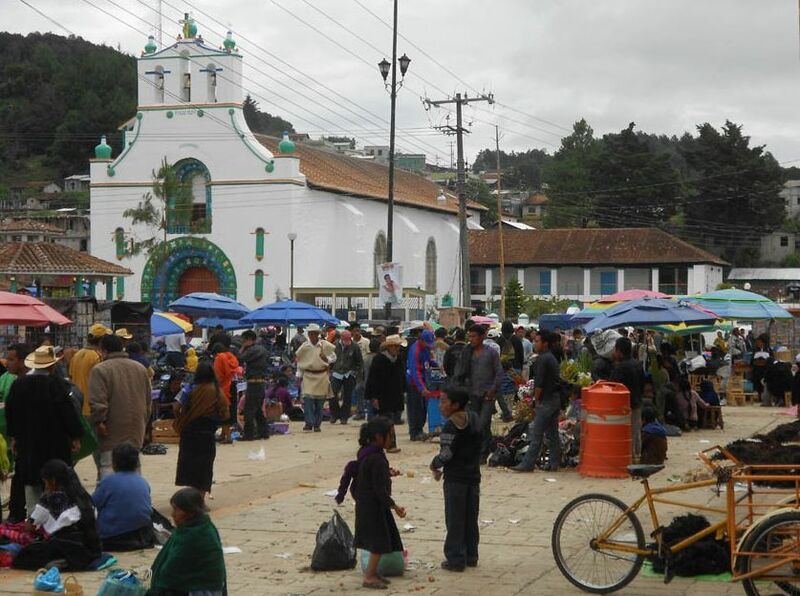 The Chamula police force is easily recognized by their white, hairy wool smocks, cowboy hats, and long sticks slung over their shoulder to enforce good behavior….and discourage tourists like me from snapping photos. (Actually, this is not one of the police force, as he is not wielding a big stick, but their clothing is the same.) The jail cells open up to the street where the inmates are on public display, as the Mayan culture is focused on the social aspect of community rather than individualism, therefore public exposure is considered a severe form of punishment. 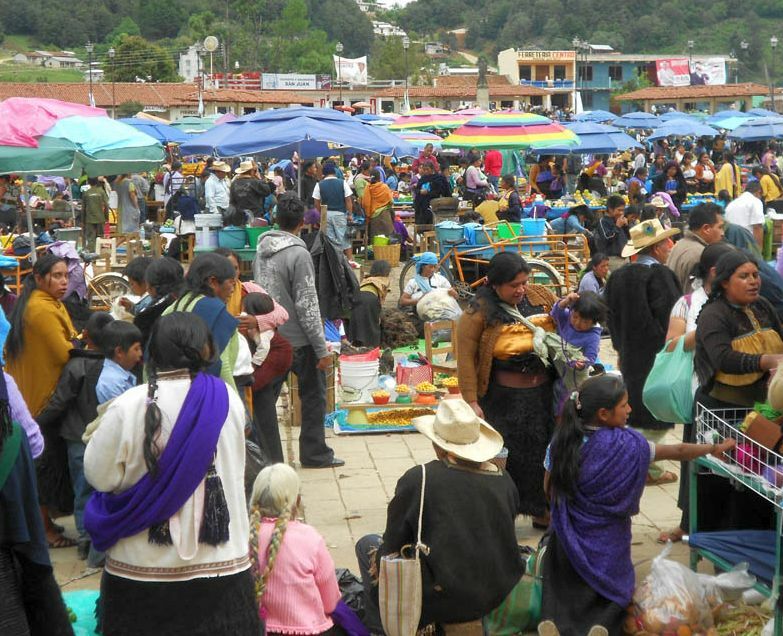 Sunday is market day in Chamula, therefore the streets are extremely crowded. Our tour van parked on the outskirts of town to drop us off near the old 19th century burned out church amidst the Chamula cemetery. 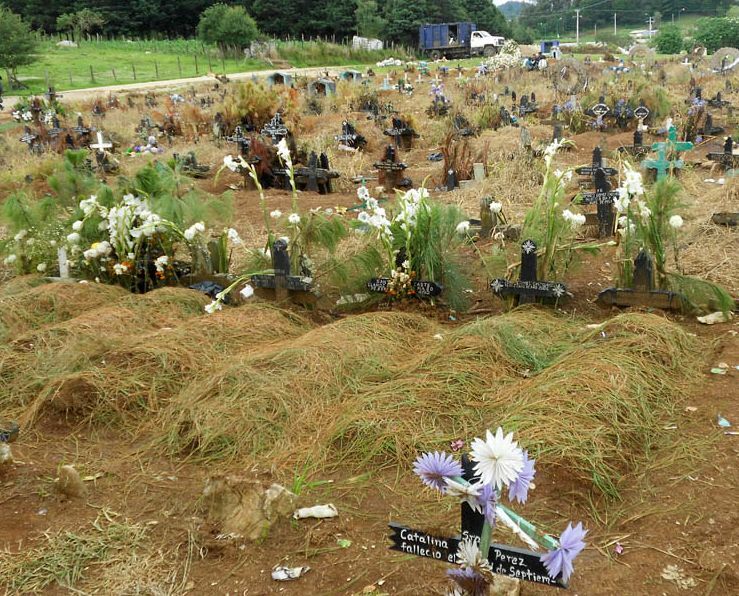 The field is covered in small crosses, their colors signifying the age of the deceased – black for the elderly, blue for young adults, and white for babies. Cesar pointed out the differences between Christianity and Mayan traditions as being similar to our own Native American culture. The Bible states that God said to Adam and Eve, “All of this belongs to you,“ whereas the indigenous people of Chamula believe the earth belongs to God, and therefore they must worship nature and protect the resources. This is evidenced by flowers and pine needles everywhere – on the grave sites, covering the floor of the church, and adorning the turquoise crosses that appear all over town, at every entrance and exit. 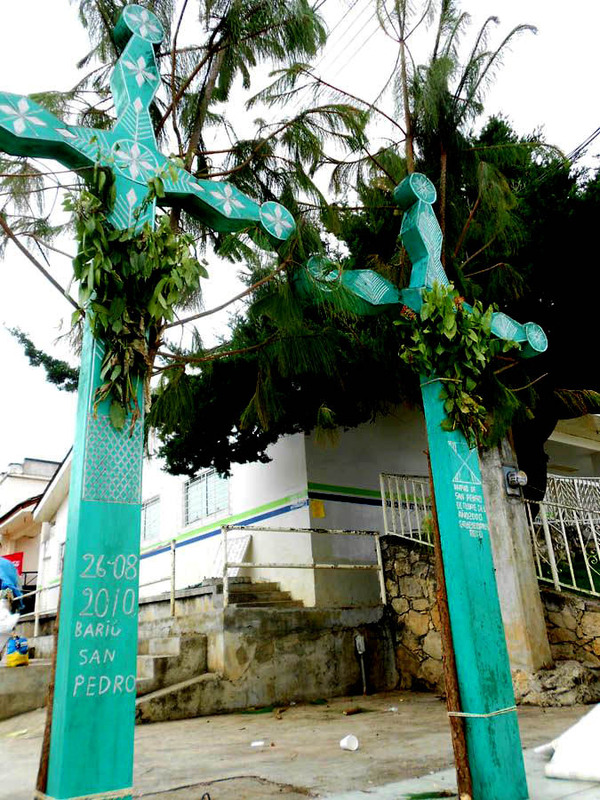 In fact, these crosses are contested as a symbol of Christianity, but instead represent the tree, believed to be the center of the world. 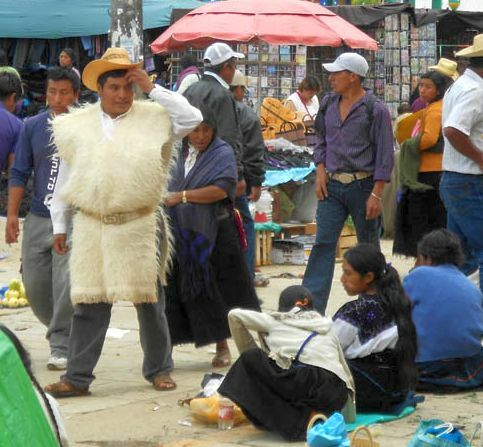 We wandered through the market where the women wearing indigenous clothing sat on blankets selling everything from live chickens to piles of varying shades of sheared wool used to make their clothing. 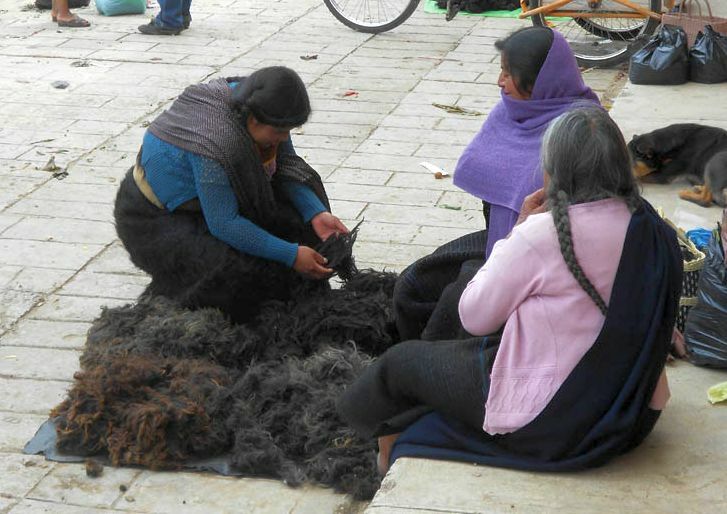 The traditional skirt for a Chamula woman is woven from “hairy” wool fabric that looks like a “faux fur” coat. 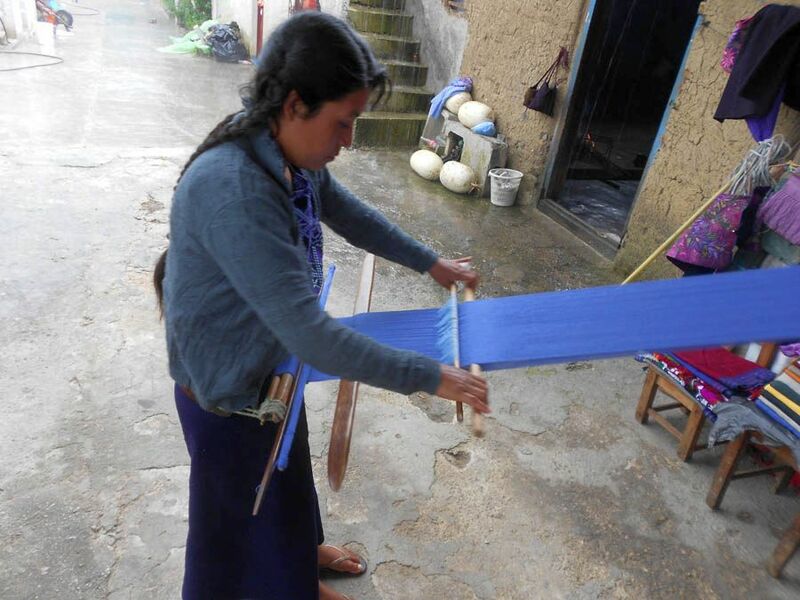 It takes one month for a woman to weave one of these skirts by hand. Although we were allowed some general panoramic-type shots of the market, the one place where photography is absolutely forbidden (and under vigilant watch) is inside the white stucco church trimmed in bright turquoise and deep blue, located in the heart of town. This strict rule toward forbidden photography only served to heighten my senses, as I knew I must commit it all to memory rather than megabytes. To say it was a “magical” place seems like such a cliché’ for as little energy I felt in the vortex of Monte Alban, I certainly felt it here. The first of the five senses to be awoken when I first walked through the front door of the church was smell as the aroma of Copal, a hard pine resin incense was thick and heady in the air. Next I was immediately awakened to touch, as I felt the crunch of the thick layer of pine needles covering every available inch of the floor beneath my feet. Then there was the sound of the monotonous rhythmic guitar and accordion, playing the a repetition of procession music over and over as people circled through the church at a slow, meditative pace. Though I would not “taste” until later, there were shots of “Pox” (pronounced “posh”,) liquor from sugar cane, being circulated among the villagers. But by far the most memorable sensory for me was the sight of thousands of flickering candles in every direction…and I do mean thousands, covering the tables, shelves, and floor. You see, there are no pews or altar in the church, because it is not a traditional Christian church. 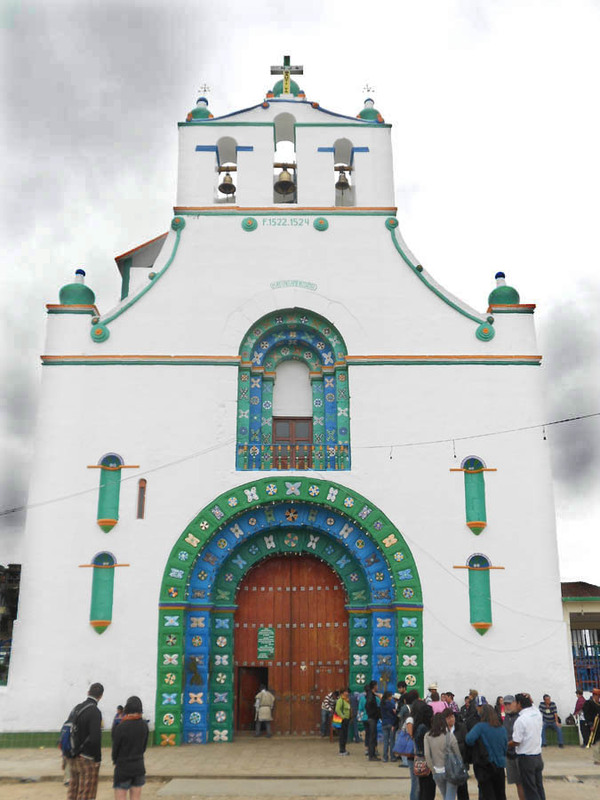 Yes, there are glass-enclosed statues of saints lining the walls, each with mirrors around their necks to reflect their heavenly spirits, but the church and the town are named after Saint John the Baptist, predecessor of Jesus, therefore their religion predates Christianity, and as a result, geared much more toward Mayan traditions. Cesar asked us to wait in the rear of the church while he explained rituals and traditions before we were released to explore on our own. This was helpful, otherwise I might have just thought the many bottles of Coke and Fanta on the floor were for refreshment purposes. But in fact, they along with the different colors of the candle tapers all have spiritual significance. Shamans practice healings inside the church – not physical healings per se, but psychological healings, in particular when one has “lost their spirit” as indicated by depression, sleeplessness, or general malaise. In ancient times, part of this ritual was for the Shaman to chew corn (Chamula’s staple) and regurgitate the contents as treatment. This modern day sodas represent those colors of the corn – Coke for black, Fanta for red/orange, and Sprite for white, each representing a different aspect for healing. So the church was crowded with groups of family members sitting on the floor, up to 10 rows of colored candle tapers lined up in front of them, and enough plastic soda bottles to make you think Coca-Cola had sponsored the event! Another key part of the shamanic practice involves chickens….not just eggs, but yes, sacrifice too. The eggs are rubbed over the body of the ailing villager, and then the Shaman breaks the egg and reads it like a cup of tea leaves. As for the poor chicken, thankfully there is no blood, but instead the neck is jerked and twisted while inside the church, then later taken home to be consumed. I would have been skeptical about this chicken practice, had I not seen one perched on a picnic blanket in the middle of the church floor, quiet and calm as if it has already accepted its fate. 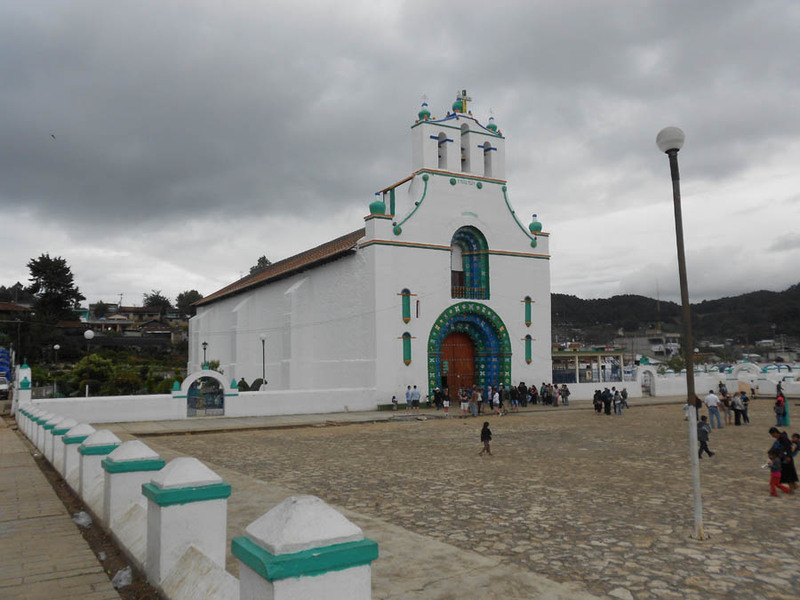 Our tour also included a visit to Zinacantan, but after the Chamula experience, it paled in comparison. Whereas Chamula is known for corn and wool production, Zinacantan’s primary production is flowers, with greenhouses lining the road and hillside upon approach. Women wear cotton woven costumes instead of wool. Being able to recognize the native village of each woman based on her clothing was an interesting aspect I had only experienced in Guatemala. 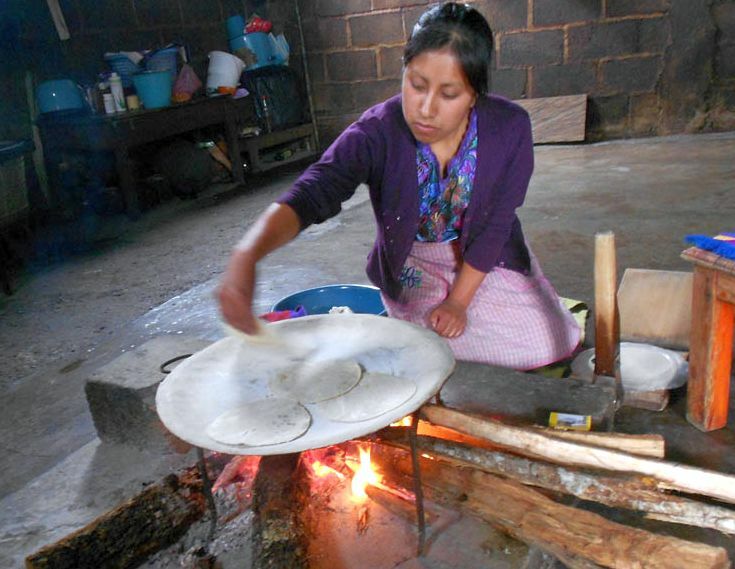 We visited an indigenous family in Zinacantan where we received a demonstration of tortillas being made from ground corn over an open fire in the kitchen. The women were also practicing traditional “back strap weaving,” a portable loom that wraps behind the waist to place tension on the threads being woven. 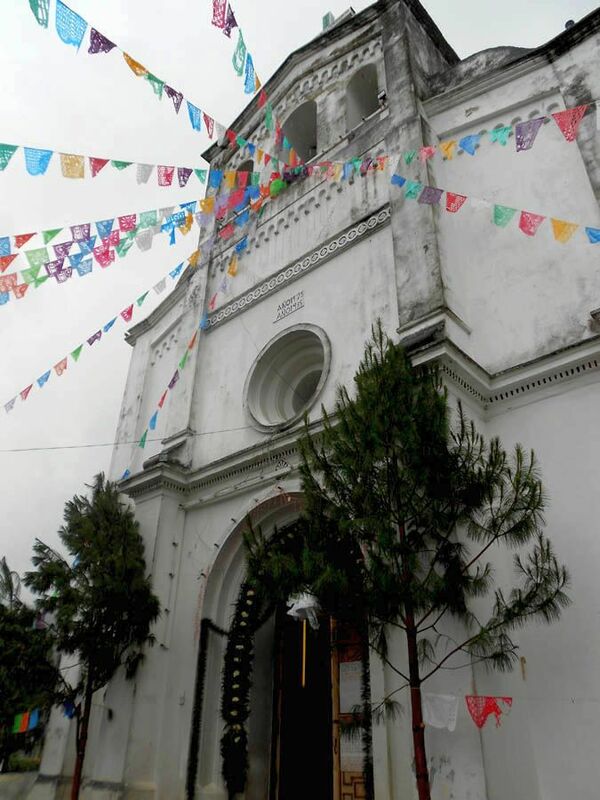 This entry was posted in San Juan Chamula and tagged San Juan Chamula, Zinacantan by Suzanne. Bookmark the permalink.